"Eric's work combines contemporary and classical references to create an astonishingly resonant dialogue with the viewer." Dutch artist Eric Basstein started painting on an early age and at the age of 19 he went to art school. He first made a name for himself in his hometown Eindhoven and soon after that other parts of The Netherlands followed. As a dj he got in contact with well known dj’s and producers, who worked with him as a dj and also as an illustrator. After 10 years in the music scene he felt that the need to paint again got bigger and bigger. In 2015 Eric decided to switch back to painting and this time with full focus. He took his experience from his musical background with him, and used that for his paintings. Inspired by the similarities between art and music, the way modern music is created by combining samples just like paintings are constructed by layering imagery, he developed a process that uses this approach when constructing work. Combining images from fashion magazines with a piece of a comic book illustration or a part of classic painting, felt similar to sampling a bass line or snare when creating hip hop music. Influenced by the likes of Velasquez, Caravaggio, Rubens or Francis Bacon, as well as music by A Tribe Called Quest, MF Doom and Madlib, he spent about a year and half locked in his studio, just working on his skills and building his visual language. Starting his process with research through magazines and books, this Eindhoven-based artist isn’t looking for particular imagery, but just picks pictures that resonate with him. Using selected elements to create abstract collages he plays with this non-restrictive puzzle until it feels right. The finished composition is than translated into acrylic on canvas with some extra additions such as color changes or background elements being added last. 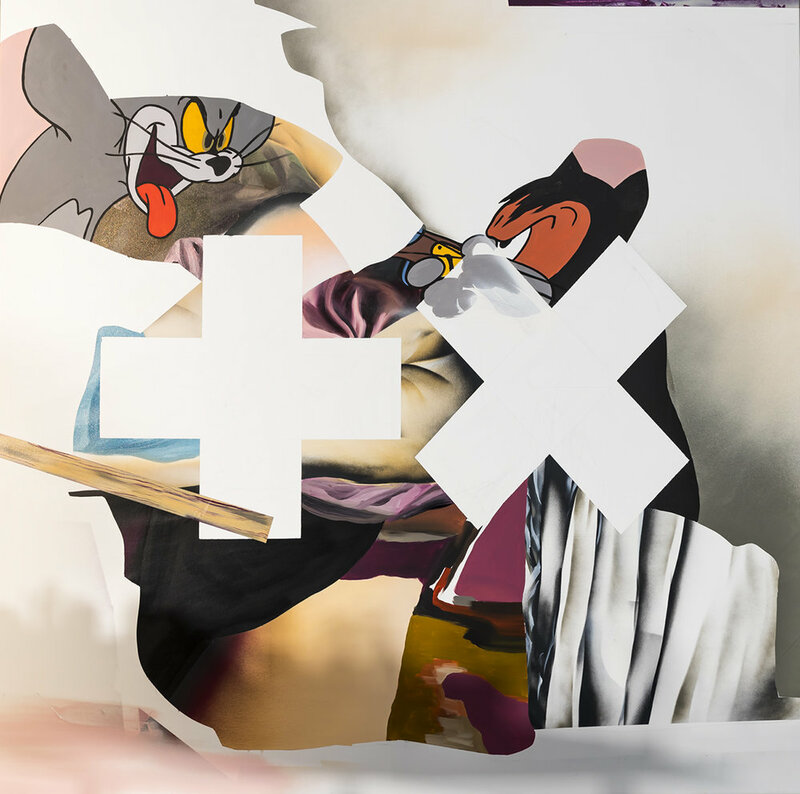 The finished pieces are graphic based fusion of various elements that form distinctive images which often play with perspective or classic art formats, as well as give strong nod to familiar icons of popular culture. Eric’s blend of the historical and modern is sublime. His paintings blends realist figurative work inspired by old masters with abstractions taken from comic books and fashion. His work combines contemporary and classical references to create an astonishingly resonant dialogue with the viewer.